Hi everyone! I hope that you are having a good weekend. Mine has been snowy. SensitiveHusband and I got out the tape measure yesterday and noted that there was three feet of frozen precipitation on the ground…and on the sidewalks…and in the roads…and on our cars. 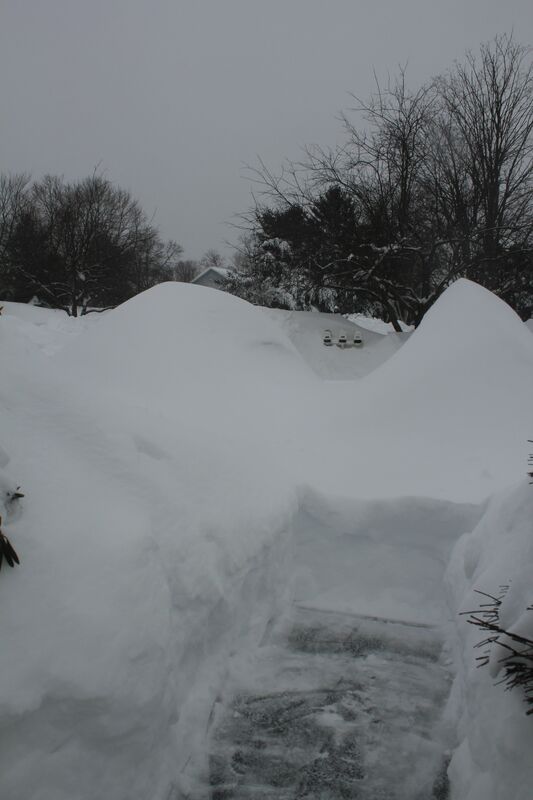 This picture shows our two cars under mounds of snow. Yes, they really are under there! So SensitiveHusband and I made a deal – he would shovel and I would bake. I know I got the better end of the deal, for sure! I decided to try my hand at a muffin. I don’t make them very often, and I thought that would be a nice snack whenever SensitiveHusband felt like taking a break from his snowy project. I found a nice recipe from Dr. Oz for Pumpkin Muffins that already called for a natural sweetener (I used maple syrup) and did not use any butter or dairy. The recipe was made moist by the pumpkin and applesauce. I reduced the amount of maple syrup used and substituted some of the whole wheat flour with oat flour (for lighter texture and lower gluten). 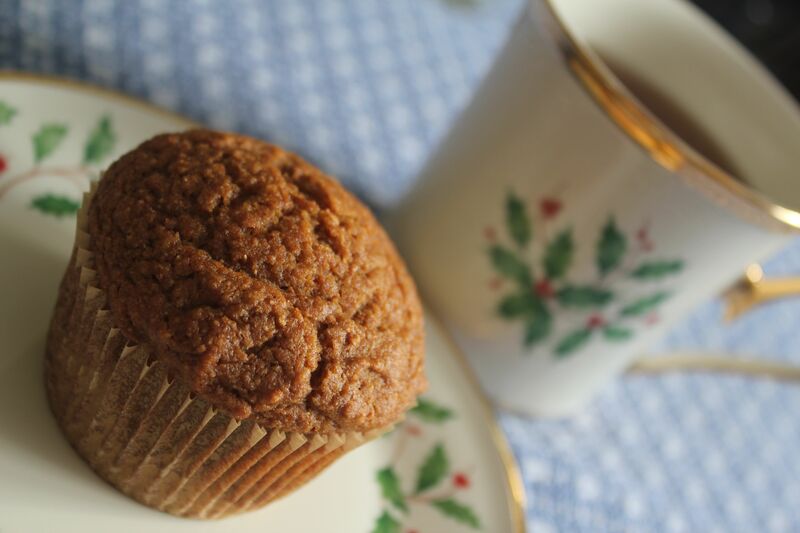 As soon as the muffins came out of the oven, SensitiveHusband was back in the house to warm up with a cup of tea and fresh muffin. We both agreed that they were delicious and that the other neighbors shoveling would probably enjoy them too. After my snack I suited up in a parka and boots, with a plate of warm muffins in hand so my neighbors could have a pick-me-up while moving all of that snow. These muffins use only two bowls to prepare, and are neighborhood approved. The recipe below will yield approximately 15 muffins. If you want to use the whole can of pumpkin, double the recipe and give the extras to your neighbors. Preheat the oven to 375ºF. Whisk together the flours, baking soda, salt, cinnamon, and nutmeg and set aside. In a large bowl, whisk the maple syrup, oil, eggs, pumpkin puree, and applesauce. Add in the dry ingredients and fold with a spatula until the dry ingredients have been absorbed. Place in muffin tins and bake 20 to 25 minutes. This entry was posted in Recipes - Breakfast and tagged breakfast, Cane sugar free, Maple syrup, Muffins, oat flour, Pumpkin, whole wheat flour, Yeast free. Bookmark the permalink. Since my husband and I are avoiding most GMO wheat, earlier this week I tried the above recipe with more tweaking. I did double the recipe (got 33 muffins) and used a combination of almond meal/flour, garbanzo flour and golden flaxseed flour. I only used a total of 1 cup of syrup rather than doubling. Since I had so many muffins, I added raisins, chocolate chips and almond slivers (6 muffins each) so this gave us some variety. Oh, and I ran out of nutmeg so added some pumpkin pie spice. Each muffin is delicious. Instead of sharing, I froze half to take on vacation for a safe treat! Thanks to Sensitive Economist for this recipe and, of course, for giving us her muffins to try! I am glad that you are enjoying the pumpkin muffins. Your flour combination sounds delicious; I will have to try that too. Have a great vacation!